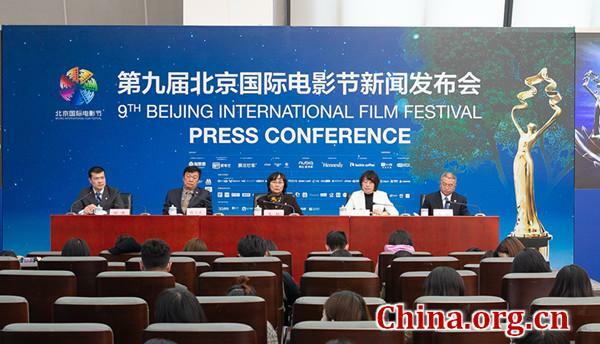 The organizers of upcoming 9th annual Beijing International Film Festival announced the jury members and the 15 finalist films in the competition section for the Tiantan Awards at a press conference in Beijing on Wednesday. 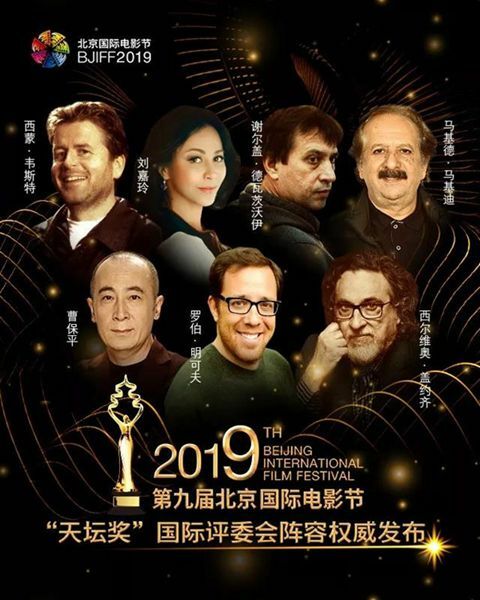 The jury president of the international panel is Rob Minkoff, the director of "The Lion King," announced Xing Bo, deputy secretary general of the organizing committee of the Festival. He named the six remaining jurors as Chilean director Silvio Gayoqi, Chinese director Cao Baoping, Russian director Sergei De Wattsvoy, Chinese actress Carina Lau, Iranian director Majid Makidi and British director Simon West. Founded in 2013, the Tiantan Awards' central tenet is "Beauty in Variety, Harmony in Diversity." Each year the jury works to find the best films on a global scale to promote film exchange around the world and promote the development of the art form. In inviting jurors, the organizing committee takes a global approach and considers the professional and artistic achievements of film celebrities both at home and abroad, Xing said. "The seven members are considered veteran filmmakers in the world's film industry. They are not only highly acclaimed and respected for their outstanding works, but each of them has also won many international film festival awards and achieved great success," Xing added. "I believe that under the leadership of jury president Rob Minkoff, the jury will continue to uphold the principle of 'fairness and justice' and select the ten best works for the Tiantan Award from the 15 outstanding film finalists." Wang Jue, another deputy secretary general of the organizing committee, later announced the list of competing films. "We solicited feature films from across the world that were produced after Jan. 1, 2018. The Tiantan Awards have attracted 775 films from 85 countries and regions, including 107 domestic films and 668 overseas films from diverse categories and styles," Wang explained. "After a series of screenings, a total of 15 films from 20 countries and regions were shortlisted for the final Tiantan Awards competition. The finalists include 12 overseas films and 3 domestic ones." The shortlisted foreign titles include: Bille August's "A Fortunate Man" (Denmark), Junji Sakamoto's "Another World" (Japan), Peter Hedges' "Ben is Back" (USA), Jayaraj's "Fear" (India), Tiina Lymi's "Happier Times, Grump" (Finland), Seyed Hadi Mohaghegh's "Here" (Iran), László Nemes' "Sunset" (Hungary/France), Ali Jaberansari's "Tehran: City of Love" (UK/Iran/Netherlands), Xirzat Yahup's "The Composer" (China/Kazakhstan), Marcus H. Rosen Mueller's "The Keeper" (Germany/UK), Eliran Malka's "The Unorthodox" (Israel), Steve Krikris' "The Waiter" (Greece), and Nuri Bilge Ceylan's "The Wild Pear Tree" (Turkey/France/Germany/Bulgaria/Macedonia/Bosnia/Sweden). Two Chinese productions included are Chen Jianbin's "The Eleventh Chapter" and Frant Gwo's sci-fi blockbuster "The Wandering Earth." The 15 films will vie for 10 award categories: Best Feature Film, Best Director, Best Actor, Best Actress, Best Supporting Actor, Best Supporting Actress, Best Screenplay, Best Cinematography, Best Music and Best Visual Effects. The China-Kazakhstan co-production "The Composer" will also serve as the opening film for the festival, telling the legend of Chinese musician Xian Xinghai who came to Almaty during the Great Patriotic War of the former Soviet Union. As a stranger in the land suffering from poverty and illness, he was rescued and supported by the famous Kazakh musician Bakhitzhan Baikadamov and his family. To the end of Xian's life, he never forgot his original passion despite hardship. He inspired Chinese and Kazakhstan people to fight against fascism with his music, according to a brief introduction of the film. The closing film of the festival is ascertained to be "Zero," an Indian Hindi-language romantic drama directed by Aanand L. Rai and starring Shah Rukh Khan, Salman Khan and Anushka Sharma. In this year's film festival, Indian films are a highlight, with 8 films from the country to be screened during the festival in the Beyond Bollywood section under the Beijing Film Panorama segment of the festival. With 500 domestic and foreign films screened across 30 theaters, 58 screens and 15 days, the Beijing Film Panorama will once again feature many films that are rarely seen or imported into China on the big screen, from restored versions of old classics like "2001: A Space Odyssey," "Gone With the Wind," "Singin' in the Rain" "Schindler's List" and "Red Sorghum," to the more recent "Hotel Mumbai." This year's Panorama is divided into 16 main segments. In order to salute to New China, the organizers planned a special titled "Celebrating The 70th Anniversary of the Founding of the People's Republic of China," which consists of the two sub-segments "Flourishing Times" and "China Through the Lens." There are also "Belt and Road," "Animation," "Japanese Film Week," "Indonesian Cinema Today" segments and more, as well as "Tribute" will screen Akira Kurosawa's classic films and several adaptations from legendary Chinese wuxia novelist Louis Cha. The tickets went on sale April 1 and most of the screenings were sold out in seconds. The Festival will be held in Beijing from April 11 to 20, 2019. The organizers of upcoming annual Beijing International Film Festival unveiled its jury and the 15 finalists for the Tiantan Awards in Beijing on Wednesday.